In Chinese cuisine, beef is celebrated. After pork, beef is the second most consumed meat in China. Beef has a high protein content and depending on the cut of meat, a low-fat protein that is high in iron, zinc, and a variety of B vitamins. In traditional Chinese medicine, beef is thought to strengthen your muscles and bones and it can improve the health of your stomach and spleen. Beef is usually more expensive than pork which is one reason it’s consumed less than pork. There are all kinds of ways in Chinese cuisine to cook beef. The most common ways are to stir-fry, boil, stew, and steam. In Taiwan, beef noodle soup is quite popular. In fact, beef noodle soup is so loved, there is an annual “Beef Noodle Soup” festival. In the Western world, most people first think of Chinese beef they think of "Beef and Black Bean Sauce". This is a popular Cantonese dish. This is a comprehensive list of some of the most popular beef dishes in Chinese cuisine. The list isn’t by any means conclusive but these are the dishes most commonly consumed. Easy beef chow mein recipe: A delicious and easy recipe of beef chow mein. This easy recipe is better than take-out and quick to make. Daikon, carrot, and tomato beef stew recipe: A classic Chinese beef stew recipe that's perfect for a cold winter night. Cantonese beef and peppers in black bean sauce: Beef and sweet bell peppers are cooked with a savory black bean sauce in this Cantonese home cooked dish. This recipe serves two people as a main dish or four as part of a multicourse meal. Beef in black bean sauce: Beef and bell peppers are cooked with a savory black bean sauce in this Cantonese home-cooked dish. Beef and snow peas in oyster sauce: The beauty of this dish is that it is both simple and adaptable: pork, chicken, or even tofu can replace the beef and other green vegetables such as broccoli can be used instead of snow peas. Honey beef with toasted sesame seeds: Beef is marinated in a honey and soy mixture, stir-fried with oyster sauce, and topped with sesame seeds. If desired, toast the sesame seeds before serving. Beef braised in soy sauce: This is an example of "red cooking," where meats are simmered in soy sauce and water. This is a more Western-style dish; for a more standard Shanghai recipe, try red cooked beef. Beef (or pork) chop suey: While chop suey is an American-Chinese creation and not an authentic Chinese dish, it may have been inspired by the stir-fried vegetables Chinese farmers used to eat after a long day working in the fields. Pork chop suey is primarily a vegetable dish; the meat is added for extra flavor. Beef chow fun: What makes this dish are the chewy fresh broad rice noodles (ho fun) that soak up the flavor of the sauces. This quick and easy version uses black bean sauce and baby corn. Beef with broccoli stir-fry: The secret to this recipe is cooking the beef in 1 cup of oil to seal in the juices and cooking the broccoli in water to make it crisp and tender. For a more authentic touch, try using Chinese broccoli, which has an appearance and taste similar to asparagus. This quick and easy version is great for busy weeknights. Beef with spicy black bean sauce: Fermented black beans lend their own special taste and flavor to this Chinese beef in bean sauce recipe, while chile paste adds extra bite. Beef with three vegetables: The Chinese believe three is a lucky number, as it symbolizes prosperity. This recipe features an interesting contrast of textures and flavors, with marinated flank steak stir-fried with bok choy, mushrooms, and red onion in a flavourful dark soy and sherry sauce. 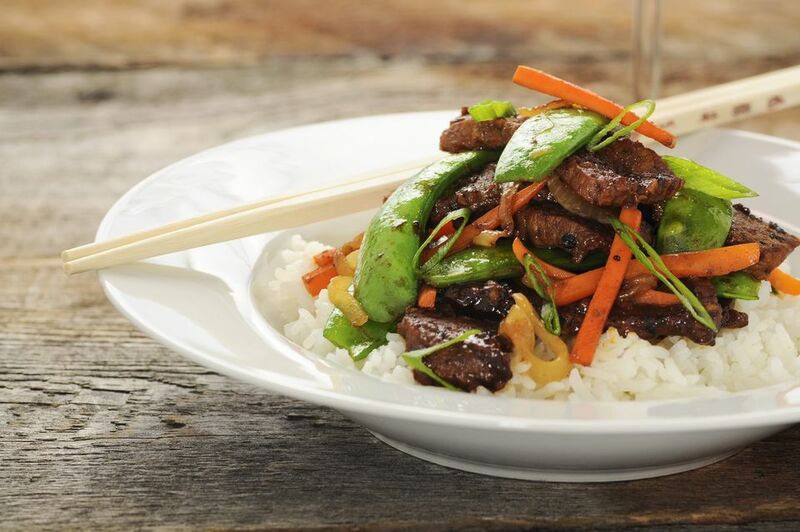 Mongolian beef with vegetables: While Mongolian beef isn't an authentic Chinese dish, it gives an example of the ingredients and seasonings used in Chinese cooking. Feel free to substitute bamboo shoots for the baby corn. Made with fresh orange peel, this spicy dish also uses dried chili peppers. Feel free to deep-fry the beef twice if desired to make it extra crispy. Stir-fried beef with oyster sauce: Oyster sauce enhances the natural flavor of beef in this quick and easy beef stir-fry recipe. Sichuan crispy beef: In this Szechuan recipe, the beef is dry-fried, making it chewy and crispy. If you like, you can replace one of the carrots with 1/2 cup of celery that has been strung and cut julienne-style. Feel free to make the dish hotter by adding more chili paste or sauce if desired. Enjoy the dishes you make!